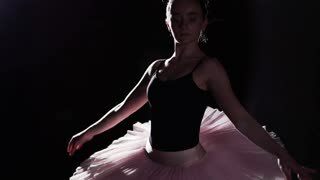 Young ballerina standing on her pointe ballet shoes in spotlight on black background in studio. Girl shows classic ballet pas wearing tutu and pointe shoes. 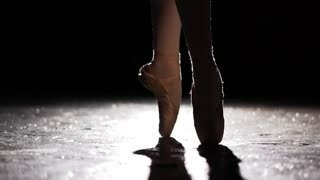 Silhouette of a ballerina standing standing on her pointe ballet shoes in spotlight on black background in studio. 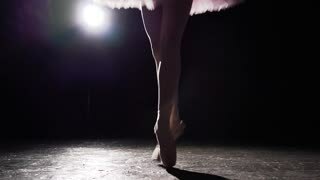 Ballerina shows classic ballet pas wearing tutu and pointe shoes. Slow motion.